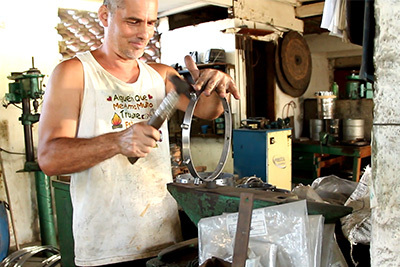 ARTCELSIOR is Rio´s most traditional company for building and creating new instruments. They changed their brand name several times (Excelsior and Lecsom, among others), nevertheless for the last decades they have been producing instruments for Rio´s samba schools. ARTCELSIOR´s people know exactly, how samba instruments are supposed to sound. They constantly receive feedback from the small to the large Rio samba schools. Together with the experience of thousands of sambistas, the drums have become as successful as they are today. ARTCELSIOR drums are rustical, functional and sound great! For the Brazilian market, the drums are made of galvanized sheet metal as well as of polished aluminium sheet. Being specialised in metal processing, ARTCELSIOR also makes brass instruments such as saxophones, trumpets and trombones besides the percussion instruments. ARTCELSIOR´s drums also were amongst the first drums available in Europe in the late 1980s. In those times they still used their brand called Lecsom and the small European Samba community played on the original drums from Rio de Janeiro. Even today and despite of having loads of competition, ARTCELSIOR still counts to many sambistas´favourite brand of instruments. 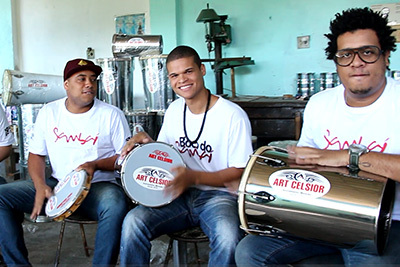 ARTCELSIOR produces all kinds of instruments which are being played in the escolas de Samba, the Pagode and the Samba de Mesa. ARTCELSIOR cuicas still set the standard and enjoy cult status.